Even though an electric car can be charged almost anywhere, EV owners do the majority of their charging at home. Indeed, owning a home charging station is really convenient, but buying one can be quite intimidating. Through this article, we want to help you choose the right home charger for your car by providing you with all the information you need. Before we get into more details, it’s important to know the various terms used for home charging stations. Indeed, most people talk about home charging station, home charger, home charge point, EVSE (Electric Vehicle Supply Equipment), wall charger or wall box but refer to the same thing. If you still have questions regarding the selection of a home charging station after reading this guide, feel free to contact us. What are the benefits of charging your electric vehicle at home? What is the difference between a Level 1 and a Level 2 charger? How to choose the right home charging station for your vehicle? How to install an EV charging station in your home? How to take full advantage of an EV home charging station? Charging your car at home is extremely simple and offers many advantages. Sleep, wake up, drive – Charging at home is the easiest way to ensure a fully charged EV before the next trip. You don’t need to worry about driving a car not completely charged or about finding the nearest public charging station. Actually, charging an EV is like charging a mobile phone, you plug it overnight, you wake up, your car is 100% charged, and you’re ready to go. Be independent – Public charging always depends on the infrastructure of the charging network and the public accessible charging stations. By charging at home, you don’t depend on the charging networks and on their charging prices. It also gives you absolute control over when you charge your car and helps you save valuable time by avoiding lines at public charging points. Save money – Charging at home is the cheapest way of charging your electric car. On average, the cost of charging an electric vehicle at home is five times cheaper than at a public charging station. In the end, an EV user only pays the price he would for his own home electricity consumption. A great option to charge at a lower cost is also to combine an EV home charger with installed solar power. This way, the car owner can ensure to use his own generated energy. By using this method, the EV owner avoids high energy costs, which typically contain a high rate of network infrastructure. As described above, charging your electric vehicle at home offers many benefits. Several options are available to charge a car at home. Actually, there are two solutions, using a cable (Level 1) or using a home charging station (Level 2). We reckon the first step before buying an EV home charger is to determine which option suits your needs best. The charging Level determines how fast you can charge an electric vehicle. Every Level runs on a different voltage. In some countries, the charging types are divided into modes rather than Levels. Mode 1 and mode 2 describe the Level 1 charging. Mode 2 differs from mode 1 by having a safety switch attached to the charging cable. Mode 3 is equivalent to Level 2 charging. Level 1 chargers: these describe the cable that’s sold with plug-in electric cars. Level 1 charging cables don’t require any specific installation, the cable is simply plugged into an ordinary household outlet. The charging time is slower than for the other Level. Level 2 chargers: this term is used to describe EV home charging stations, generally firmly mounted on the wall. This type of charger enables higher powers than the Level 1 charger. Consequently, the charging time is faster. On average, a Level 2 charger can reduce charging time in half. For better battery health, many manufacturers recommend using a Level 2 charging station. Moreover, constant charging from a power socket can lead to overheating. The table below illustrates the main differences between Level 1 and Level 2 charging stations and helps understand even more the characteristics of both types of chargers. Now that you understand the difference between the different Levels or modes, you’re already able to know if a home charging stations Level 2 is necessary for your EV. Indeed, it depends on your needs, especially on the distance you drive per day and on the time you have to charge your car. 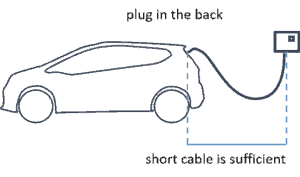 If you just use your car occasionally and just for short distances, a simple cable (normally provided with your car) will be sufficient. Otherwise, we suggest you should invest in a home charging station. And from now on, we will only focus on this type of charger. The main reason to purchase a home charging station is the time it takes to charge an electric vehicle. People have different needs and expectations. Some people need to charge their car in 3-4 hours, some in 6-8 hours or even longer. Understanding the time you need to charge your vehicle will help you select the right EV home charger. You can calculate the charging time of an electric vehicle using the formula: “Charging Time [h] = Battery Capacity [kWh] / Charging Power [kW]. We also invite you to check our EV charging time calculator. Actually, the charging time depends on a number of different factors, some pertaining to the vehicle and others to the charging station. 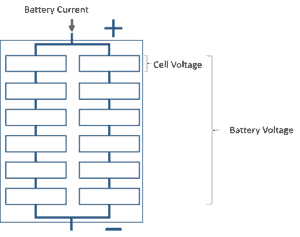 The state of the battery: If the battery has a low State of Charge (how full a battery is), then the battery has to be charged longer until it’s fully charged. The battery size: the battery pack sizes vary from a vehicle to another. The bigger the battery is, the more time it will take to charge the vehicle. The temperature of the battery: If the temperature of the battery is very low or very high, the charging time will take longer. If the battery has a high temperature, then the charging power is limited to make sure, that the battery doesn’t overheat. If the battery is cold, it cannot take high currents, because the resistance of a cold battery is typically higher than the resistance of a battery at room temperature. The temperature range: If the temperature is higher than the temperature range, the charging station will reduce the charging power in order to not overheat. On the other hand, if the temperature of the charging station is too cold, it could experience some problems like being unresponsive for example. Various factors influence the charging time of a vehicle. To understand the time it takes to charge an electric car, it’s important to understand the notion of actual maximum charging power which is determined by both the power range of the vehicle and of the charging station. The actual charging power can be limited either by the vehicle or the charging station. The lower maximum charging power dictates the actual charging power. In other words, if the vehicle has a lower maximum charging power than the charging station, the vehicle is the limiting factor in charge time. If the charging station offers a lower rate than the maximum charging power of the vehicle, the charging station is the limiting factor. The table below shows two examples of the limitation of the actual maximum charging power. In the first example, the actual maximum charging power is limited by the home charging station. However, we can see in the second example that the actual maximum charging power is limited by the maximum charging power of the vehicle. To determine the total charging time of your vehicle, you need to divide the battery size of your car by the actual charging power. Please note that this is the charging time calculation for a completely empty battery. The table below shows the calculation for three different vehicles with different battery sizes. We can see, that the Vehicle 3 with the high battery size takes longer to be fully charged than the other vehicles when the same charging station is used. The higher the charging power of the charging station is, the faster the charging time is. The charging time for a range of 100 km doesn’t depend on the battery size. Rather it depends on the charging power of the charging station and the ratio of kWh per 100 km. In the table below we can see, that the vehicle 2 with the highest energy consumption per 100 km has a longer charging time than the other vehicles when the same charging station is used. You can now calculate the time you would need to charge your electric vehicle with any charger. However, you need to take other parameters into consideration before your purchase. What is your ideal charging time? Before making any decision, you need to determine your ideal charging time. In the section above, we have seen that both the power range of the vehicle and the charging station have an impact on the charging time. Depending on the maximum charging power of your vehicle, you have no need to buy a home charging station with a too high maximum charging power. Generally, home chargers with more power tend to be more expensive. How often do you use your car? How far do you drive every day? The next point to consider is your typical usage of your electric vehicle. If you rely on having a fully loaded EV available after a short charging time, then you should consider a charging station which can charge your EV with a high power and fast. On the other hand, if you don’t constantly need a fully charged car and can easily let the vehicle be charged for a longer period, for example overnight, then you can think about installing a cheaper charging station with a lower charging power (e.g. If you drive under 50 km on average a day, then a Level 1 charging cable might be sufficient for your needs). Do you park constantly in the same spot? Do you have easy access to a power connection near your parking spot? First of all, if you have a permanent parking spot, ideally a garage or a carport, and have access to the power connection, then you can think about installing a charging station. You should also consider the size of the charging station, it should fit in the future installation position. Do you park your car indoor or outdoor? The parking spot affects the selection of the charging station. If the parking spot is outside, you should consider purchasing a weatherproof EV charger. This information should be found in its description. If you’re planning to install the charging station in a garage, it doesn’t necessarily need to be weather resistant. What is the usual weather and temperature in the city you live in? Depending on your place of residence, you should take into account the temperature of the city where you live. Some home charging stations only work under a certain temperature range. Just make sure that your future charging station also works under the right weather conditions. How long should the charging cable be and how many cables do you need? 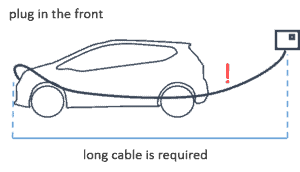 The length of the cable should be long enough to pass between the future position of the charging station and the EV charging plug. Keep in mind, that the plug position at the car varies between different cars. Some charging stations enable the customer to charge two or even more EVs at the same time. This could be a good option to charge the EVs simultaneously. When considering the length of the cable, keep in mind that the cable and the plug should not be stressed. You should also take into account where the plug is located on the car. What type of plug do you need for your EV? Different countries have different plug types. Selecting your charging station, make sure to choose the right plug for your EV. Have other people access to your personal home charging station? Another important aspect to consider, you should also ensure that no other EV users can easily charge another car on your costs. This can be ensured by a registration system at the charging station. This system can be a key, an RFID chip or a charging card. The system just ensures that the owner of the charging station decides, who is allowed or not to charge an EV at the charging station. Do you plan to change your electric vehicle in the future? When selecting your future charging station, you need to consider the vehicle you want to charge. This doesn’t only include the vehicle you already have but also vehicles you might want to charge in the future. Not all EVs can be charged with the same charging power. As seen above, when selecting your charging station, you should consider if you want to choose a charging power that fits the maximum charging power of your actual EV or if you’re considering to buy a new EV in a near future, that might have a higher maximum charging power. Many people ask us how they should install their home charging station. Please find below our suggestion. If you feel unsure about the installation, we recommend asking a qualified electrician for help. Some manufacturers provide a list of certified electricians to install the charging station in your home. Before the installation, you should also consider having an electrician check the accessibility to your power connection. The electrician can check if the power of your house limits your maximum charging power. Then you might save money buying a charging station with less power than a charging with more power that you’re not able to use. Most of the people simply install charging stations in their home without taking into account any other advantageous aspects. Find here a few tips to take a full advantage of your EV home charger. The costs for energy vary between each country and each provider. At the moment the energy costs for private households are constant over the day. But in the energy market, where the energy provider and big companies participate, the costs vary during the day. In the diagram, an example of the energy price over the daytime is shown. You can see, that the energy price is high for the time, in which many industrial machines are working and at 6 pm, a time where many people come home and start cooking. In regions with mainly big power plants (e.g. nuclear power plant or stone coal power plant) which cannot be easily stopped and started, the energy prices are cheaper at night and higher in peak times, when the most factories are running. In regions with many solar panels installed, the energy price typically declines, when the sun is shining strong. For home charging station users, it can be economically reasonable to charge when the energy prices are the cheapest. This is shown in the picture by the green zone. To realize this, the user needs to have a contract with his energy provider, that contains dynamic energy prices. To make sure that the charging process starts at the best price available, the charging station should be programmable or even connected to the energy prices. This way the user can begin the charging process at a certain time (e.g. at 3 am) and especially when the energy prices are the cheapest. The link between the charging time and the energy price could be realized if the charging station was connected to the internet. An internet connection could also be useful if you want to connect your charging station to an app. Making a live check on the charging process possible. If the process of charging at the best price is realized by many cars, the energy prices and the energy consumption of a region can be balanced. In a future market with potentially many EVs, the impact of the balancing could have a major impact on the energy market. Background information: In an energy market, the amount of injected energy has to match the amount of used energy. Therefore, some power plants need to be turned on or off, regarding the power consumption in the energy market. Some power plants are used just to balance the market consumption (e.g. pumped hydro storages). With smart charging or intelligent charging, the charging stations could use algorithms to optimize the charging cycles towards the particular customer’s needs (e.g. to ensure that the battery is fully charged when the driver drives to work in the morning). With intelligent charging, this algorithm could learn and adapt to changes over time. The bidirectional charging means that the charging station can charge and unload the battery of the electric car. This could enable the user to use the energy left in the battery of the users EV to power some high power consumers (e.g washing machines). With this method, the user can avoid paying high energy costs when he wants to use the washing machine and reload the vehicle battery when the energy prices are lower. Together with other users of bidirectional charging stations, the users can organize themselves into a so-called virtual power plant. Acting together as one power plant on the energy market. If the prices for power are high on the market, the virtual power plant could supply power from the EVs that are not depending on their battery energy at the particular moment. For the health of the EV battery, it’s positive to keep the battery at a low state of charge (SoC). With the mentioned functions like smart charging, intelligent charging, programmable charging, bi-directional charging, the charging period can be defined, so that the battery is kept in the optimized state of charge and still is fully loaded when needed for the drive. One of the biggest concern of people is understanding an EV home charging description. For this reason, we created a lexical explaining all difficult terms. The lexical gives you an explanation for some technical terms regarding home charging stations. This overview shall give you enough insight to understand charging stations descriptions. 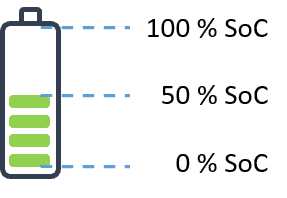 The State of Charge is used to describe to which percentage the battery is charged, the SoC ranges between 0% and 100%. The short-term of State of Charge is SoC. The scale is chosen by the manufacturer, meaning that 0% SoC doesn’t necessarily mean, that the battery has a voltage of 0 volts. But rather, that the battery should not be unloaded any further for the sake of the health of the battery. The same goes for 100% SoC, if the battery has a SoC of 100%, the battery should not be charged any further. For a long life, it’s recommended to use the battery in a SoC range between 40% and 60%. The battery size is often given by in current x time (Ah), this indicates how much current over time the battery can provide. The battery size can also be given in kWh, indicating the energy that is stored in the battery. The voltage of the electric vehicle battery is given by the battery cells and the design of their wiring. The voltage of each cell wired in series adds up to the voltage of the battery. Typically, the battery voltage is in about 400 Volts, some car manufacturers are even going up to 800 Volts. The voltage of each cell depends on its state of charge (SOC). Typically, the voltage of the cell ranges between 2 and 4 Volt. The voltage of the cell results from the difference between the anode and cathode potential, the potential varies by the chemical composition. For electrical vehicles mostly the NMC (Lithium Nickel Manganese Cobalt Oxide) cells are used. The battery life describes the time in which the battery is used for a certain task. Typically for EVs, the battery life is ending, when the expected range of the EV is only 60% of the range, which the EV had at the beginning of the battery life. The end of life for batteries is called EoL, the EoL defines the point, at which the battery doesn’t store enough energy to fulfill its tasks. The charging current is the current charged by the charging station into the electric vehicle. The charging current is limited by the resistance of the wiring and the resistance of the battery of the electric vehicle. The resistance of the wiring is given by the physical characteristic of the wires and the design of the electrical circuit. The thicker the cables are the lower (better) the resistance of the cable is. The Resistance of the charging cables is calculated in the same manner as for the resistance of the wiring. The thicker the cable is the lower the resistance of the cable is. The longer the charging cable is, the higher the resistance of the cable. The charging power is calculated by Voltage * Current. The higher the charging power is, the faster you’re able to charge your electric vehicle. Keep in mind that the electrical vehicle limits the charging power as well as the charging station. If the electric vehicle cannot be charged with the maximum power of the charging station, then the charging current has to be limited. The internal resistance of the charging cable, the car battery and the wiring in the car define the power loss during the charging process. The charging loss is calculated by Current² * Resistance. The charging loss is mostly the part of the charging power heating up the cables and the battery. This shows why it’s crucial to limit the charging current to the maximum current because otherwise, it could lead to an overheating of the cables or the battery. The Efficiency can only be calculated as if the system combining the electric vehicle and the charging station is given. As a potential owner of a charging station, it’s important to have a high charging efficiency because at the end of the month you’ll pay the electrical provider for the charging energy. The charged driving distance depends on the energy consumption of the electric vehicle. This means, that a car with lower energy consumption can drive a longer distance with the same charged energy than a car with a higher energy consumption. Choosing your charging station, you should ensure, that the charging station can charge enough energy at the time, that you can take to charge your car for your daily routine. A fast charging mode can be used in some charging stations. This mode is often limited in time, to ensure that the system (charging cables, wires, and the battery) doesn’t overheat. In many cases, this mode is sufficient to charge an amount of energy sufficient for the next short trip. Depending on your use of the home charging station and your daily routine, this can be a useful feature. To prevent the charging station from overheating some charging stations have a cooling system installed. These systems are necessary for high charging powers. AC and DC are terms describing the type of current and voltage. AC stands for alternating current, meaning, that the current moves in a waveform in a positive and negative direction. AC is typical for the powerlines and typically used in houses. DC stands for direct current, meaning that the current only moves in one direction. DC current is used for power transmission over great distances because it leads to less inductive losses. EV Batteries are charged with direct current. When the charging station provides AC the transmission from AC to DC happens in a unit inside the vehicle. Charging stations with a higher power often charge with DC. We hope you find this page helpful. If you have any further questions, feel free to contact us. We would appreciate your comments and ideas to optimize this page.